The Ministry of Industry and Trade of Vietnam publicized a draft Decision that will replace Decision No. 11/2017/QD-TTg issued by the Prime Minister of Vietnam dated 11 April 2017 on mechanisms to encourage the development of solar power projects in Vietnam. The Draft Decision is expected to be in full force from 1 July 2019, if approved by the Prime Minister of Vietnam, and introduces major changes in comparison with Decision 11. This Draft Decision modifies the previous draft issued on 29 January 2019. Floating solar power project – a grid-connected solar power project with solar panels installed on structures floating on a water surface, directly connected to the power grid of the Electricity Vietnam (“EVN”). Ground-mounted solar power project – a grid-connected solar power project having solar panels, being (a) installed on the ground, directly connected to EVN’s power grid, or (b) installed on a rooftop, with capacity of more than 1 MWp, directly connected to EVN’s power grid. Solar power project with an integrated storage system – a grid-connected solar power project that uses an electrochemical power storage system and that is directly connected to EVN’s power grid. The stipulated minimum efficiency of the storage system is 25% of alternating current capacity in two hours. Rooftop solar power project – a solar power project which has solar panels installed on a rooftop or attached to a building with the capacity of less than or equal to 1 MWp. Power consumption household model is a rooftop solar power project with a connection point between the metering system and the consumption system. EVN must pay for any of the power generated from the rooftop project that is delivered to EVN’s power grid instead of being consumed. 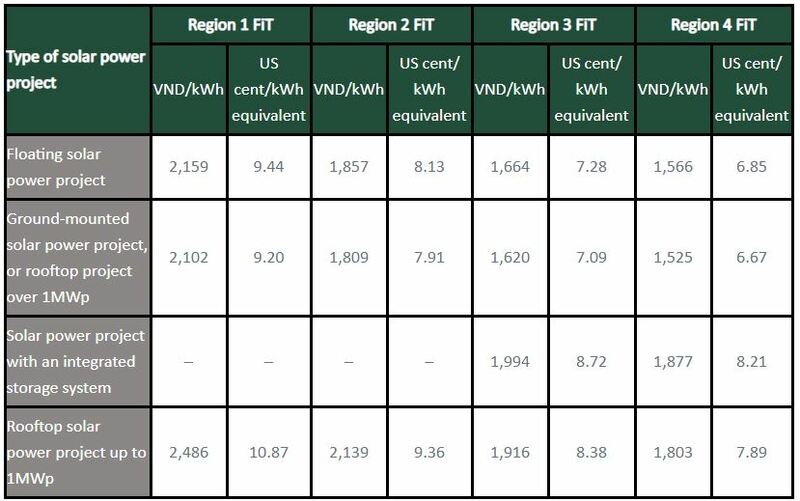 The price payable by EVN is the applicable Feed-in-Tariff (the “FiT”) stated in the table below. Business family household selling electricity model is a rooftop solar power project with a connection point between the metering system and the power grid of the power purchaser. EVN must pay for the amount of power from the rooftop project delivered to EVN’s power grid at the applicable FiT. Direct power sale and purchase is a model whereby investors produce and sell power from the rooftop solar power project to other entities, and where the project does not connect to or otherwise consume power from the national power system. Producers and consumers shall freely reach an agreement on the tariff purchase price. The substance of the contract must be in accordance with current regulations on civil and commercial activities. Any residual power delivered to the power grid shall be sold to EVN, at the applicable FiT. Intermediary power sale and purchase is a model of sale and purchase where producers sell power from the rooftop solar power project by first connecting to the power grid of any private (i.e. not EVN) power distribution and retail entities. The consumers off-take from the national grid and any surplus is sold at the relevant FiT (table below) to EVN. Any private power distribution and retail entities participating in this model have the responsibility to coordinate with EVN to record the amount of power sold from the solar power project onto the power grid through a metering system. EVN shall directly pay the power producer. The Draft Decision specifies a different FiT depending upon (a) the type of project and (b) in which of four irradiation regions the project is located. The higher FiTs are applicable to regions with lower irradiation levels. In contrast, Decision 11 only applied one FiT. The proposed new FiTs are applicable for 20 years for that part of, or the whole of, solar power projects connected to the grid which have a commercial operation date in 2021 (the exact date in 2021 is not stated in the Draft Decision). Region 1 (28 provinces): Ha Giang, Bac Kan, Cao Bang, Tuyen Quang, Thai Nguyen, Lao Cai, Yen Bai, Lang Son, Quang Ninh, Phu Tho, Vinh Phuc, Bac Giang, Hai Duong, Hoa Binh, Ha Noi, Ha Nam, Bac Ninh, Hung Yen, Hai Phong, Ninh Binh, Thai Binh, Ha Tinh, Nam Dinh, Quang Binh, Thanh Hoa, Lai Chau, Nghe An, Son La. Region 2 (6 provinces): Quang Tri, Dien Bien, Thua Thien Hue, Quang Nam, Da Nang, Quang Ngai. Region 3 (23 provinces): Kon Tum, Ca Mau, Hau Giang, Binh Dinh, Bac Lieu, Kien Giang, Soc Trang, Can Tho, Vinh long, Tra Vinh, Lam Dong, Ben Tre, Tien Giang, An Giang, Dak Nong, Ho Chi Minh City, Dong Nai, Dong Thap, Ba Ria – Vung Tau, Long An, Binh Duong, Binh Phuoc, Tay Ninh. Region 4 (6 provinces): Phu Yen, Gia Lai, Dak Lak, Khanh Hoa, Ninh Thuan, Binh Thuan. The Draft Decision is currently being publicized on the MOIT’s website and comments will be received until 15 April 2019. The information provided here is for information purposes only and is not intended to constitute legal advice should be obtained from qualified legal counsel for all specific situations.